Car Boot Bingo | Grab £15 FREE + 900% in bonuses! 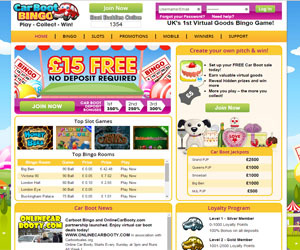 CarBoot Bingo is one of the newest sites on the Live Bingo Network. The site is packed with all sorts of bingo promos, games and other goodies that are sure to make the ride extra comfy. CarBoot Bingo has a vast array of bonuses and promotions stuffed in the boot. To begin with, when players join they can claim a nice £15 Welcome Bonus with no deposit required. Once signed up, players have an incredible plethora of different promotions to choose from. Some of the fab promos include the Newbie Bonus Feast, refer a friend Amazon voucher rewards and the Awesome 20% Cashback special on all of your deposits every week. Also, be sure not to miss out on the Happy Hours, amazing Chat Games and Free Cash Bingo games available 24/7. There are plenty more promos but they are too numerous to list… there's that many! So check them out! Carboot Bingo hosts an amazing variety of 75 ball, 80 ball, 90 ball and even 30 ball bingo games. In addition to the impressive collection of bingo games, CarBoot offers players a lovely selection of Galaxy Bingo slots, casino games, scratch cards and free bet games. Some of the top game titles at Car Boot include Honey Bees, the brand new Plushie Pleasure, Wizard's Castle and many more amazing games. Car Boot Bingo can be played on a multitude of mobile devices Whether you have an Apple iPhone, iPad or Android Phone or Tablet, Car Boot Bingo has got you covered. When you join Carboot you can claim a love £15 FREE No Deposit Bonus. Additionally, you’ll be entitled to claim a whopping £35 bonus after depositing your first tenner. Then you can claim another 500% in bonuses on your second and third deposits. Car Boot Bingo’s main site has a tremendous selection of 90-ball, 80-ball, 75-ball and even 50-ball games. The mobile site caters to players with an extensive collection of slots and casino games. Some of the top slots available include Queen of Legends, Rubies & Sapphires, Treasures of Egypt and loads more. There’s also great casino games like Classic Blackjack, Roulette and Keno.